Patrick and John Collison land at #8 on the Irish side of The Sunday Times Rich List since they are valued at £1.15bn (€1.474bn) . "The wealth of San Francisco-based brothers Patrick, 27, and John, 25, is soaring as their online and mobile payments company Stripe, founded just six years ago, powers upwards. The Castletroy-born brothers are the youngest and fastest billionaires in Irish history. With Visa investing in July, Stripe’s value grew to #3.5bn and we value the brothers’ stake at €1.15bn. Stripe makes online payments faster and is used by Facebook, Twitter, Apple and Chinese online giant Alipay. The college dropout brothers, currently Irish EY Young entrepreneurs of the Year, operate frugally. John, who achieve achieved the highest score yet in the Irish leaving Certificate, is said not to even have an office." Brown Bag Films arrives for the first time on The Sunday Times Rich List, arriving at position 242. 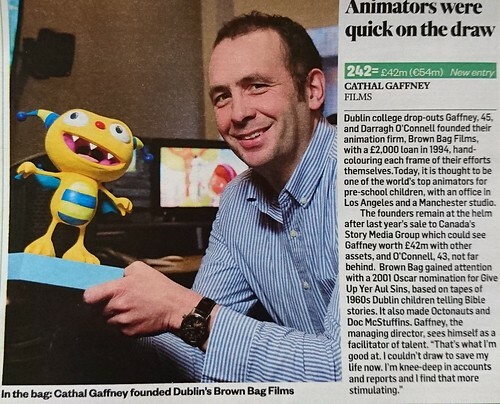 "Dublin college dropouts Gaffney, 45, and Darragh O’Connell founded their animation firm, Brown Bag Films, with a £2,000 loan in 1994, hand-colouring each frame of their efforts themselves. Today, it is thought to be one of the world’s top animators for pre-school children, with an office in Los Angeles and a Manchester studio. "The founders remain at the helm after last year’s sale to Canada’s Story Media Group which could see Gaffney worth £42m with other assets, and O’Connell, 43, not far behind. Brown Bag gained attention with a 2001 Oscar nomination for Give Up Yer Aul Sins , based on tapes of 1960s Dublin children telling Bible stories. It also made Octonats and Doc McStuffins. Gaffney, the managing director, sees himself as a facilitator of talent. 'That’s why I’m good at. I couldn’t draw to save my life now. I’m knee-deep in accounts and reports and I find that more stimulating.'" 1. “The Sunday Times Rich List 2016” in The Sunday Times Magazine, April 24, 2016, p 105. 2. “The Sunday Times Rich List 2016” in The Sunday Times Magazine, April 24, 2016, p 105.